Knoxville based organization TNFirst held its Tech Challenge Regional Robotics Competition for the first time in middle Tennessee. 28 teams consisting of 300 middle and high school students competed for bragging rights. 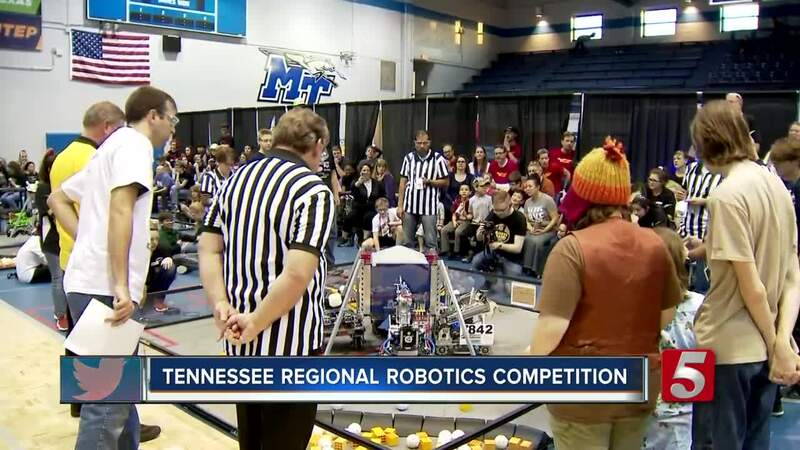 MURFREESBORO, Tenn. (WTVF) — Knoxville based organization TNFirst held its Tech Challenge Regional Robotics Competition for the first time in middle Tennessee. 28 teams consisting of 300 middle and high school students competed for bragging rights. Participants and their robots competed in various tasks through out the day. The event took place at Alumni Memorial Gym at Middle Tennessee State University from 11am to 7pm on Saturday. Organizers say it gives students an opportunity to learn about engineering, business planning and designing in a hands-on environment. Teams from Knoxville, Memphis, Tullahoma, Lawrenceburg, Oak Ridge, Shelbyville, Manchester, Nashville, Dayton, Ohio, and others will be competing. Teams are comprised of up to 15 students per team and two to three mentors. Participants and their robots compete within a 12-by-12-foot playing field. The robot's starting maximum dimensions, in inches, is 18 wide, 18 long and 18 high. The robotics kit is powered by Android technology, features professional-quality software options and includes 11 motors, nine sensors, two game controllers, wireless communications, metal gears and all the building materials participants need. This year's game is called "Rover Ruckus," using a 2-on-2 format played on the 12-by-12 field. Sixty matches are scheduled to rank the 28 teams, with elimination matches to determine the event winner. The winning team of Saturday's competition was team 8417 Lectric Legends from Lawrence, Kentucky.